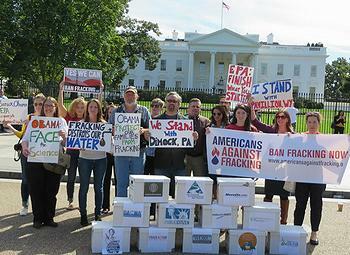 WASHINGTON, DC, September 25, 2013 (ENS) – Residents of three states who say they were harmed by gas drilling and hydraulic fracturing, or fracking, held a news conference in front of the White House today to demand that the government reopen investigations into fracking-related drinking water pollution in Pennsylvania, Texas and Wyoming. They then delivered 250,000 signatures on a petition stating their demands to U.S. Environmental Protection Agency Administrator Gina McCarthy at EPA headquarters. The residents were all part of EPA fracking investigations in their states that the agency abandoned despite evidence of fracking-related water contamination. The petitions were collected by Stop the Frack Attack and Americans Against Fracking and its advisory committee member, actor Mark Ruffalo. This event comes a month after Dimock, Pennsylvania resident Ray Kemble and Susquehanna County resident Craig Stevens delivered over 50,000 petitions to the EPA asking the agency to reopen its investigation into the possible connection between gas drilling and water contamination in Dimock. “For years now, I have had to live with toxic, poisoned fracked water in my home,” said Kemble, a former gas industry employee and affected Dimock area resident. In late 2010 in Parker County, EPA’s investigations led the agency to issue a rare emergency order because at least two homeowners were in immediate danger from a well saturated with flammable methane. But more than a year later, the agency rescinded its order without explaining why. Although EPA had scientific evidence connecting the driller, Range Resources, with drinking water contamination, the agency changed course after political pressure from the company and its lobbyists, Associated Press reported. More recently, the EPA abandoned its fracking study in Pavillion, which found benzene, a known carcinogen, at 50 times the level that is considered safe. Instead, the EPA handed its investigation over to the state of Wyoming, whose lead politicians have voiced their support for fracking. This research will be funded by EnCana, the same company whose drilling and fracking operations may have caused the groundwater contamination at issue. The 14 organizations involved in EPA petition delivery are: Berks Gas Truth, Catskill Citizens for Safe Energy, Catskill Mountainkeeper, Center for Biological Diversity, Delaware Riverkeeper Network, Earthworks, Energy Action Coalition, Environmental Action, Food and Water Watch, Frack Action, Gasland, MoveOn.org, Public Citizen and the Western Organization of Resource Councils. Today’s demonstration follows one million public comments delivered to the Obama Administration against fracking on public lands. 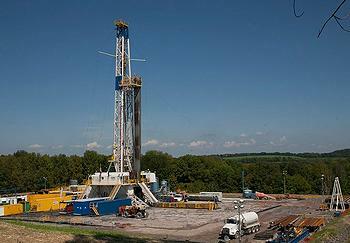 The comments came as the public comment period closed August 24 on the Department of the Interior Bureau of Land Management’s second version of its proposed Oil and Gas; Hydraulic Fracturing on Federal and Indian Lands rule. The BLM rule applies to more than 750 million acres of public lands and minerals: underneath tribal lands, national forests, wildlife refuges and other special places, and also beneath more than 50 million acres of privately-owned land, and drinking water sources for millions of Americans.